We proudly present: The comletely rewamped Data Tape 3. Data Tape 3 is the best app to merge file parts (.001, .002, .003 etc.) to get the original file. These file parts are usually distributed over the Internet if the original file is too large. Data Tape 3 is compatible with HJSplit and handles all common formats for file parts. Data Tape comes in a free basic version. 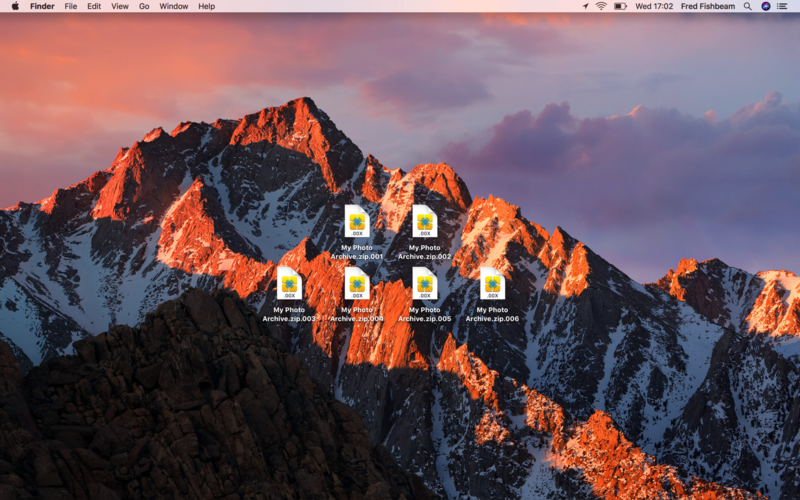 With Data Tape Pro, you can create also ".zip" archives with password protection and divide and merge folders and Mac bundle files. Data Tape 3 is the best app to merge file parts (.001, .002, .003 etc.). These file parts are usually distributed over the Internet if the original file is too large. Data Tape 3 is compatible with HJSplit and handles all common formats for file parts. After a file has been merged, Data Tape automatically moves the subfiles to the trash. If the file was also compressed as ".zip", Data Tape unpacks the archive for you. Data Tape will pass other archives to the respective uncompressing app. Data Tape works perfectly with Safari. You can start merging if Safari has not yet completely loaded all the pieces. Data Tape waits for the completion of the download then and merges already fully loaded parts in the meantime. The basic version of Data Tape is available for free download and you can use it for free. Using Data Tape Pro, you can create ".zip" archives and compress files as a ".zip" archive before splitting them, if desired also protected by a password. Data Tape Pro can split, compress and merge entire folders, multiple files at the same time and bundle files. Support the evolution of Data Tape so that we can add more types of compression in the future. Even more comfort: With Data Tape Pro, the start window will no longer annoy you. * You are not allowed to downoad or share data without the permission of the copyright holder.